So often opera soars or swoons, but #ROHskin is built for suspense, sexual tension and simmering violence stitched into the score. #ROHskin contemporary music intriguing story told with doll houses and dressing up; immaculately performed; refreshing start of 2017. What did you think of Written on Skin? Written on Skin runs until 30 January 2017. Tickets are still available. Another troubadour opera, after Saariaho's L'Amour de loin! There are similarities in the often slow, often intimate, time-suspending quality of much of the music, but in little else. Here there are no reminiscences of troubadour songs, indeed the character is recast as an illuminator of manuscripts, so we have descriptions of miniatures we can scarcely see (even with binoculars) and a destabilising framework whereby the protagonists often narrate their own actions as they unfold. All of which is apparently intended at once to distance and to draw us closer by removing any illusion of realism. Well, maybe so: if less overused, it might be more effective. 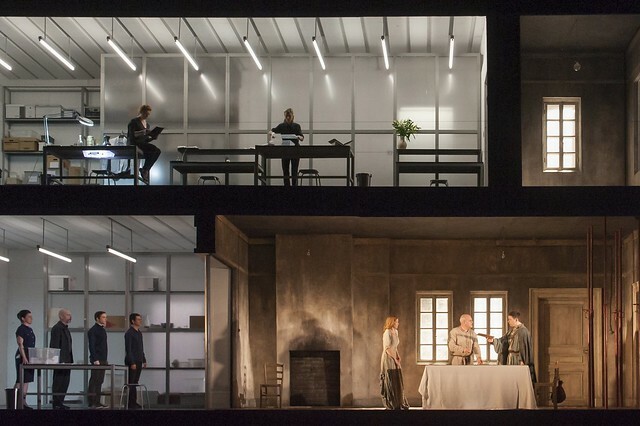 The production makes play on the dual timeframe of the middle ages and now, inevitably adopting the current favourite cliché of a split stage. It adds further layers of ambiguity by sometimes contradicting what the text is telling us. At the end, as Agnes throws herself from a balcony, we see her slowly mounting a staircase into the gods alongside angels. The image, intentionally or otherwise, cannot help evoking Jacob's Ladder. Yet earlier it was suggested that paradise, despite appearances, is here and now. The music clearly demands repeated hearing, much of a first exposure to the work being concentrated on the unfolding drama. 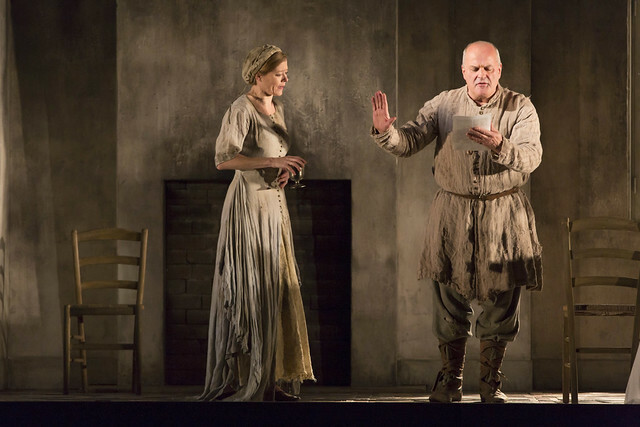 Much of the text would be unintelligible without surtitles (the penalty of writing a major role for a high soprano) but all three leads gave compelling performances. Iestyn Davies, indeed, has already made this role his own. So, a piece that throws up many questions, and not, I suspect, always the questions that were envisaged. But then, maybe that's one of things the authors are saying about the role of art in society. With a sick Christopher Purves miming close physical contact with his colleagues while James Cleverton sang from the wings, the Protector may yet inflict further injury on his wife and her lover. Expect more cast changes in subsequent performances. The performance this evening was musically extraordinary in all respects - but what was the point of the multiply split set? Clearly there was the intention to invoke modern parallels - but it seemed little more than an inexpressive mess. I very much wanted it to work, but what was it all about? I saw the 2017 production twice. The second time was much better, because I covered my eyes. 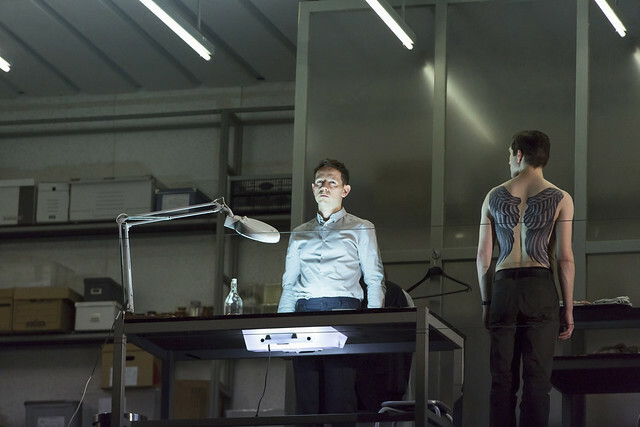 Katie Mitchell's staging of Written on Skin, though she was involved in the creation from the start, suffers from the same problems as her disastrous Lucia. Mitchell is insensible to the nuance of music and words, and insists upon the most obtusely literal interpretation, shoving the most obvious possible visualization of the story on the audience. An off-stage murder? Better stage it, says Mitchell. A handful of allusions to modern life in the libretto? Better waste half the stage on them, says Mitchell. It's as if she'd never heard of a narrative frame, or had any understanding of how they work in opera ro in storytelling generally. Mitchell's production is not merely a distraction but an actual detriment to what Benjamin and Crimp have created. The unstated production of Written on Skin was superior in every respect, simply because Mitchell was kept away from it. I was thrilled to hear that Benjamin's next opera has been commissioned by the ROH, but deeply disappointed that Mitchell will once again be involved. This has been open for comments since mid-January. That there have been only three to date (indeed it is now several days after the last performance) suggests that there may be a mismatch - irrespective of the merits or otherwise of piece, production, performance - between the claims made by management and the interest of the general public.